This years county closed was held at the Northumberland club over the weekend of 16th-18th of January. The entry was pretty good with 3 mens events A/B/C and Ladies. The favourite was defending champion Dave Barnett and in the absence of last years finalist there was going to be a debutant finalist. The top half of the draw went to seedings with Barnett and 4th seed Liam Gutcher meeting in the semi final. Barnett won through convincingly winning 3-0. The Bottom half however had lots of upsets. Number 2 seed Richard Elliot from Westoe lost 3-1 in the quarter final to junior champion Richard Shellam who had also upset Nick Hale in the opening round. Shellam almost made it a hat-trick of victories when narrowly losing out 3-2 to 3 seed Craig Forsyth in the semi. Forsyth had made a smooth passage till then and made it to his first county final. In the final favourite Barnett took early control and never let it go despite strong resistance from Forsyth. Barnett won 3-0 and took his 6th consecutive title. 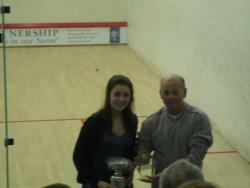 After winning her first senior county title last year Kim Hay was favourite to regain her title. She had some new competition this year with Carol Page a O40 national champion who has recently moved to the area. Page beat last years finalist Emma Barnett 3-0 in the semi final looking very strong while Hay beat Karen Heron 3-0 in the other semi to set up the anticipated final. It proved to be a very close match, despite a good start by Hay ,Page took the first game. Hay then took control and won the next 2 and looking likely to win in 4. Page never gave up and won a close 4th before Hay again took control winning the 5th 9-2 and winning her second title at 17 years old.